Issue No. 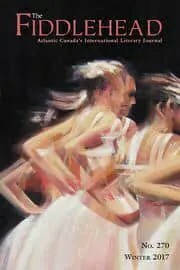 270 of the Fiddlehead literary journal sports an attractive cover with art by Ann Manuel entitled “Blur 1” making you feel that what is contained within is something special. There are works of short fiction by Jasmina Odor, Charlie Fiset, David Clerson (an excerpt from his otherworldly novel Brothers (translated by Katia Grubisic), Darryl Whetter and David Carpenter. There are poems from no less than twelve different poets as well as book reviews. I’ll briefly look at two of the stories, Jasmina Odor’s Skin Like Almonds and David Carpenter’s Hope. Skin Like Almonds is the wistful recollection of three weeks spent on the Croatian Adriatic coast by the unnamed storyteller and her friend Eva who are “on the verge of being no longer young” at age twenty-five. It has been several years since the Bosnian War ended and the friends were separated by the storyteller’s move with her family to Canada, while Eva’s family stayed behind. They meet two young Bosnian students and spend their days on the beach, going to clubs and generally enjoying a time without the burdens and responsibilities of adulthood. Hope is the story of Ethel Ringrose, a practical girl who is charmed by an itinerant door-to-door salesman in the days leading up to WWII. The salesman, Hardy Munge is successful at what he does but spends money as fast as he makes it, usually on drink. Once married, Ethel will have none of that in her house, so Hardy finds work on the West Coast which is fine by Ethel, who can do pretty good on her own, managing to get a job at a jewelry store which, when oil is discovered in the province, gets customers with all the “new” money to spend. Hope is an insightful look at relationships and what one considers more important, living like a spendthrift, or being more judicious and staid, like Ethel. The Reviews section includes reviews of recent works of fiction as well as poetry.